Owe Aku works to bring back our way of life which includes humanity’s role in nature: we are a part of it, not outside of it, not having dominion over it. To achieve this Owe Aku works to stop toxic mining that contaminates our water and land. Owe Aku has reestablished programs that utilize the wisdom of our ancestors in combating the effects of inter-generational trauma caused by colonization and the intentional attempts for hundreds of years to destroy our culture. ... read more. 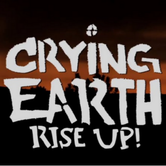 In honor of World Water Day, we share this excerpt from Crying Earth Rise Up- a Lakota story of water featuring Debra White Plume. “We sought spiritual guidance and were told that the spirit of Unci Maka will awaken people to protect her. 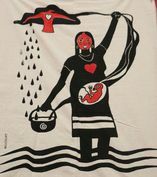 For us it has always been about protecting sacred water, whether it's uranium mining or KXL.” Debra White Plume, Owe Aku, Moccasins on the Ground....Read more. The Moccasins on the Ground training developed by Owe Aku's Sacred Water Protection Project focuses on skills, tactics, and techniques of nonviolent direct action. These three day training camps allow discussed that includes such things as blockading heavy equipment, workshops on strategic media, street medic training, knowing your legal rights with respect to civil disobedience, building solidarity and alliances, applicable international human rights and the Declaration on the Rights of Indigenous Peoples, Lakota sacred teachings on water, and many other topics under the umbrella of direct action. Wioweya Najin Win on freeing your mind through sobriety to fight for clear decolonized thinking and the preservation of the Lakota way of life…read more.